Norman attorney Jim Loftis has over 30 years of experience in representing people who have been seriously injured. The focus of his practice is on cases where people have been injured in car accidents, by dangerous products, and who have been treated unfairly by insurance companies. Mr. Loftis takes pride in the service and commitment he gives to the people he represents. He has the courtroom skills and work ethic required to successfully handle the most complex cases. 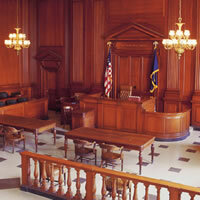 If you are an out of state attorney with a question regarding Oklahoma law or procedure, we welcome your inquiries. Mr. Loftis has an average AV Preeminent Rating with Martindale-Hubbell and is well respected by both the Plaintiffs’ and Defense Bar within the Oklahoma Legal community. He served as the President of the Cleveland County Bar Association in 1998, the Oklahoma Trial Lawyers Association in 2003, and also served as a Member and Chairman of the Judicial Nominating Committee in 2012. Whether you have a client who was injured in Oklahoma and are looking for competent local counsel, or just have a question regarding Oklahoma law or procedure, he would love to visit with you. The Scales of Justice is balanced only if you have qualified and experienced lawyer on your side. Let Jim Loftis help you even the playing field. His firm is recognized for the hard work and legal skill he provides to his clients. If you need legal representation, call him for a free consultation.